PaSsu Diary : Exam is an irrational torture: I hate it! Exam is an irrational torture: I hate it! We call it examination time, the week long period at the end of the year to see if the students could go to next grade or get into college or a job. I wrote examinations for seventeen years of my life so far to rightfully hate it. I hate it because it lacks logic and I hate it because it is an official torture. 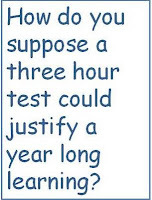 How do you suppose a three hour test could justify a year long learning? Toughest of subjects like sciences in classes ten and nine are just given one and half hour of exam time. In a few hours you fill up a few pages and that goes to rewrite the destiny of your life, is it time enough for such a serious decision? Let’s look at it professionally; is examination in anyway capable of accessing the achievement of vision of education? Education is countless values and life skill while exam narrowly test the book stuffs. The most disciplined, the most obedient, the most responsible, the most decent students go unacknowledged except for their test scores just as the naughtiest chap could walk out as the best. Where is justice? Is education all about testing the memory power? Where is the logic in giving children three hours to show what they have got in last six thousand hours? Luck surpasses logic in exams. What someone studied thoroughly has not come in the question paper, thus he fails the exam but look who failed whom? The paper failed to have the question on the part he has studied! Ever wondered why Dechenphu is crowded with students before exams? Exam is a game of luck! Isn’t exam hall a torture chamber? Thank god we at least come out alive. Three hours is too short to justify a person’s knowledge and negotiate his future, but it’s too long a time for a young student to sit continuously on a hard bench without the freedom to move around. In these three hours a young child has to endure multiple trauma- continuous stretch of attention (at the most a child has an attention span of just 10 min), writing longer than ever before the pen blisters the fingers, the hard bench almost changes the shape of the hipbone, in such long sitting we can’t escape the call of nature that makes the mind restless, and the silence and the tiredness could welcome sleep. Worst is not mentioned yet; why exams have to be in winter? Did we forget we live on the Himalayas? We must have adopted our education system from India, instead of hugging it all blindly we should at least have had the logic that if we bring buffalo to Haa it should be in the summer. Our fingers freeze, our toes become numb and only thing that keep running in our head is the urge to run out in the warmth of the sun. Our handwriting go crazy, you take ages to shape up a word and after sometime even the mind seems to freeze. 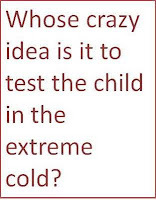 Whose crazy idea is it to test the child in the extreme cold? Isn’t exam a torture? Forgive the teacher in me for carry this contradictory perceptive, but I must confess I hate it more as I watch my students struggle through the torturous hours. I agree with the exams being in winter is really torture. We need to change our final exams onto summer and then have quite long break so as to help parents in the field or others or to take participate in other activities. Ofcourse, thats what our education system is really missing ...the education we have is really bookish one..no other activities are there at all...thats what i found out! This is the first time I've visited your blog, and it's - excuse me - by chance that I stumbled upon it. As a teacher yourself as I understand from your blog, I think it's grossly inappropriate on your part to have made public your opinion about examinations no matter how justified, reasonable and scientific your observations may be. Straight to the point … I wonder how you form simple words to create such wonderful sentences of persuasive and realist mood, which induces me to follow your footsteps…keep going PaSsu sir. Yes, I agree with you completely and 100%!!! Exams test the bookish knowledge yet it ignores basics qualities of human beings. Exams can only measure how someone can memorize and a little logic to deal with the equations. On the other hand, real life is all about compassion, understanding, obedience, respect, trust, sincerity and so on and so forth. Someone can pass and clear the grade amidst the long years of indulging into unworthy activities…here all I could see is little bits of extra time and intelligence… in depth it lacks sincerity, obedience, real knowledge… exam is just an unfair means to measure a student/persons’ capacity and worthiness. An exam makes a person literate…but not educated. Exams measure memory capacity, and exams are just a torturing test … you have raised a point as a teacher, I am sure you knew the Best… can there be another way to measure a person’s quality through yearlong…???? I heard in West, the yearlong assignments have more weight than the only the final exam, but the last fight matters in our concept!!! Dear Gem Tshering, thank you so much for the sincere comment, and I am impressed that you finished reading all my post already. Keep following, I have more to write and with readers such as you I am inspired to writer better. Are we ready for the Coldest Winter ever? Why do we need a religion? why a new one?